Owners Honey and Russell have been here since 1999, and they have developed an all encompassing pub, with a reputation for good beer and great food. Co-owner and chef Honey, produces an extensive menu of homemade dishes, and she is rightly proud of her Vegetarian and Vegan dishes. If there is something that comes with your meal you don’t like, i.e. salad, tell us and we can swap it for something you do like i.e. peas or beans. This is great news, I can’t wait to try it out. amazing to find Vegan options nearby, thank you for sharing. 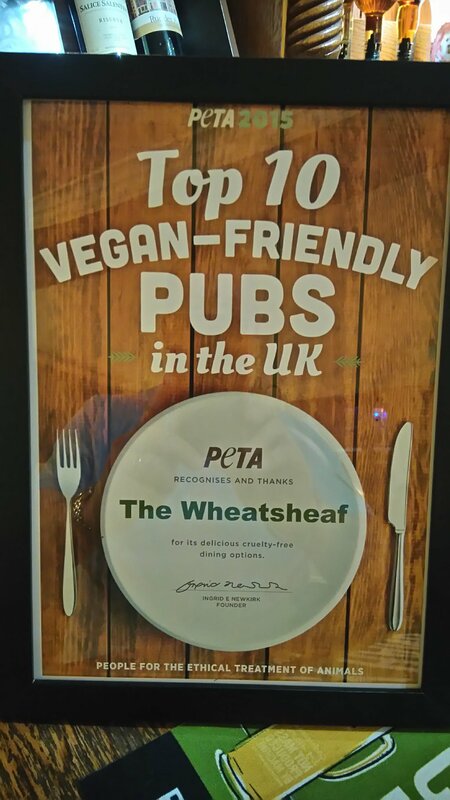 I visited The Wheatsheaf in Thornbury in January 2015 and was pleasantly surprised by the amount of vegan options available. I had a bean burger which came with vegan cheese and salad. I was also given two vegan dressings in a bottle (from Aldi, I think) and some Plamil mayonnaise. On the menu there were also vegan burritos and soups. Also there was a good selection of vegan sides. The owners said they usually have more than one vegan special on the board too. The beanburger I had was pretty standard pub food, not amazing but certainly good enough, especially for the price, and I will definitely go there again next time I visit Thornbury.